For the third successive day, here comes another price reduction at HMY Yacht Sales as Jack Robertson sends details of a price drop on an unnamed 30.5m Benetti motor yacht. Built by the Italian yard to ABS class in 2004, she had an extensive interior refit in 2010/2011. The layout of the boat is well thought out, offering spacious social areas as well as more intimate quiet spaces. All the staterooms are large with an on-deck master that's typical of a much larger yacht. 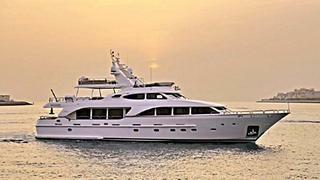 Accommodation is for eight guests and twin 1400hp Caterpillar engines give her a cruising speed of 15 knots. Lying in Dubai, her asking price is down from $6.495 million to $5.995 million.